O Hotel Caribani está localizado em Bani e alberga um restaurante. Disponibiliza um casino no local, amplas comodidades de conferências e acesso Wi-Fi gratuito. Os quartos possuem uma televisão por cabo, um mini-frigorífico e uma casa de banho privativa com um chuveiro e WC. O restaurante do hotel serve cozinha de estilo internacional, e os hóspedes também podem desfrutar de uma bebida no bar no local. Estão disponíveis outras opções a cerca de 300 metros. A Praia Salinas fica a 25 minutos de carro e o Aeroporto Internacional de Las Américas, na capital de Santo Domingo, a 1 hora e 30 minutos de carro do Hotel Caribani. Villas Campomar offers luxury villas with private swimming pools and access to a private beach and club house, located a 7-minute walk away. Baní town is just 9 km away. Each stylish Campomar villa is surrounded by lush tropical gardens and features air conditioning and a living-dining area with satellite TV. All villas have 3 full bathrooms, an additional toilet and a fully equipped kitchen and BBQ facilities. A supermarket can be found within a 15-minute drive of Villas Campomar, while the Bani Dunes and Salt Flats are within a 25-minute drive. Santo Domingo city is 70 km away. Casa El Almendro offers accommodation in Baní. Guests benefit from terrace. The villa is composed of 5 bedrooms and 5 bathrooms, equipped with a bath or shower. There is a dining area and a kitchen. A flat-screen TV and DVD player are provided. Other facilities at Casa El Almendro include a year-round outdoor pool. The nearest airport is Las Americas Airport, 73 km from Casa El Almendro. Com uma piscina exterior e um restaurante, o Sava Salinas está localizado em Las Salinas, a 7 minutos de carro da Praia Salinas e de frente para a Baía Las Calderas. O acesso Wi-Fi é gratuito. Cada villa bem equipada providencia uma televisão de ecrã plano com canais por satélite, ar condicionado e uma varanda. Há uma cozinha completa com uma mesa de jantar e uma área de estar. A casa de banho privativa tem um duche e uma banheira. Vistas sobre a cidade e a área da piscina podem ser apreciadas a partir destas acomodações. No Sava Salinas irá encontrar uma sauna, um jardim e comodidades para churrascos. É possível desfrutar de uma variedade de actividades no local ou nos arredores, incluindo pesca, mergulho e wind-surf. A propriedade dispõe de estacionamento gratuito. O Aeroporto Internacional de Las Américas pode ser alcançado em 2 horas de carro. O Hotel Salinas dispõe de uma piscina, de um terraço e de vista para o mar. Está localizado na Praia Salinas, na Bahia de las Calderas. É disponibilizado um ginásio e acesso Wi-Fi gratuito em todas as áreas. Os quartos proporcionam uma decoração moderna, ar condicionado, uma televisão por cabo e uma varanda com vista para o mar. As casas de banho dispõem de um chuveiro. O restaurante do hotel serve cozinha local e há serviço de bar. Outras opções podem ser alcançadas em 10 minutos de carro. Actividades como passeios de barco, pesca e passeios, podem ser organizadas no local. O Hotel Salinas fica a 5 minutos de carro de Las Dunas de Bani e a 01:30h de carro do centro de Santo Domingo. O Aeroporto Internacional de Las Américas está a 2 horas de carro. Located right on the seafront, Hotel Ibiza offers a private beach, an outdoor pool, a hot tub and terraces with views over Ocoa Bay. Santo Domingo is 90 km away. Each air-conditioned room at the Hotel Ibiza features bright contemporary décor. All rooms have cable TV and a private bathroom. The hotel has a bar and a communal TV lounge. Staff can also help arrange activities in the surrounding area, including boat rides and fishing trips. The small town of Palma de Ocoa is a 10-minute drive from Hotel Ibiza, while San Jose de Ocoa is a 40-minute drive away. Valle Nuevo National Park can be reached in around 2.5 hours by car. Set in Palmar de Ocoa, this villa features a garden with a barbecue. Guests benefit from terrace. Free private parking is available on site. There is a seating area, a dining area and a kitchen complete with an oven, a microwave and a toaster. A flat-screen TV and DVD player are featured. There is a private bathroom with a bath or shower. You can play billiards at the property, and the area is popular for skiing. You can engage in various activities, such as snorkelling, fishing and canoeing. Located in Palmar de Ocoa, Villa del Palmar de Ocoa offers an outdoor swimming pool, free private parking and a terrace with a view of the sea. This villa will provide you with a TV, air conditioning and a balcony. There is a full kitchen with a microwave and an oven. Featuring a bath, private bathrooms also come with a hairdryer. You can enjoy mountain view. At Villa del Palmar de Ocoa you will find a garden, barbecue facilities and a terrace. Activities in the surrounding area include fishing. The National Zoo and National Museum of History and Geography are 100 km away, while La Isabela International Airport is located 71 km away. Featuring a garden with an outdoor pool, Villa Palmar de Ocoa is a villa set in Palmar de Ocoa. The property features views of the sea and is 10 km from Las Salinas. Free WiFi is provided . There is a dining area and a kitchen as well as a private bathroom. Free private parking is available at the villa. You can play billiards and squash at the property, and the area is popular for cycling and fishing. 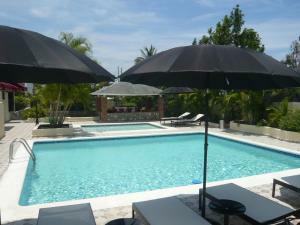 The property has a private beach area and car hire is available.